It's Tool Time! Remember that classic bit? 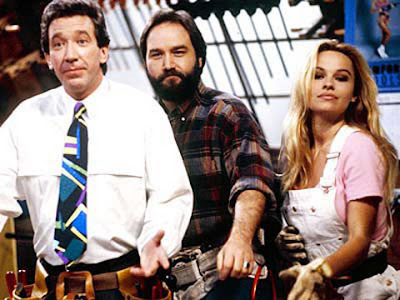 Ahh, the good old days, with Tim Allen and his Home Improvement gang. Some great Creative Grids Basic Range rulers! We chose 2 of our most popular sizes. The 6" x 12" is such a handy go-to tool for your ruler collection. And I especially like it when I am packing up to go places like classes, guild meetings, retreats, etc., because I don't worry about breaking it like my longer ruler that pokes out of my bag. The 6" x 6" size is so practical for squaring up common sizes of blocks as we are constructing the next masterpiece. It can be used for all those half-square triangle or quarter-square triangle blocks, flying geese blocks, etc. And fussy cuts! As is standard with Creative Grids rulers, they have the non-slip underside to make your cuts more accurate. Nothing worse than a slippery ruler! The "Basic Range" of rulers has all the essential markings, but they have eliminated the 1/8" marks to make things a little clearer. They are printed in black and white, making them useful on most shades of fabric. Notice how well the dark lines show on the lighter section, but the white lines really show up on the dark purple? So it's time to upgrade to these new rulers, and start out the new year right with excellent tools.